In recognition of the importance of the role of CCS within broader climate change mitigation strategies, governments are increasingly examining the concept of carbon capture and storage ready (CCSR). A number of governments within Europe and North America have moved to deploy CCSR as part of the suite of policy levers being used to mitigate greenhouse gas emissions, in particular CO2, arising from fossil fuel power generation and industrial processes such as iron and steel smelting, cement production, refineries and chemical processing. A CCSR policy can provide a crucial regulatory backstop where a carbon price is absent or insufficient to drive the deployment of new low-carbon technologies. A critical component of all CCSR schemes seems to be the incorporation of effective triggers to ensure liable entities move from CCSR design to actual CCS retrofit and abatement of CO2 emissions. 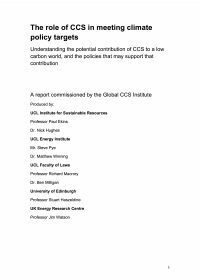 Until policy drivers support investments in CCS solutions in a commercially attractive manner CCSR provisions can serve to enrich policy portfolios aimed at facilitating CCS deployment. While it may be too early to provide a definitive assessment on the success or otherwise of CCSR policy implementation, it does seem from the experiences of those countries that have adopted it, that such approaches are effective in sending very strong government signals to the investment community to expect increasingly strident future emissions reduction commitments, as well as general support for CCS technology and its potential to deliver reliable and competitive baseload energy, and large scale and timely mitigation.